As you might remember, I’m heading to Mexico next week! After we booked the trip, I started browsing the web for swimsuits and beach wear and came across this adorable beach bag at Anthropologie, but when I saw the price tag, I cringed a bit. I don’t mind investing in a good bag, but spending over $100 for something that’s just going to sit in the sand and likely get dirty? No thanks. So instead, I made my own! 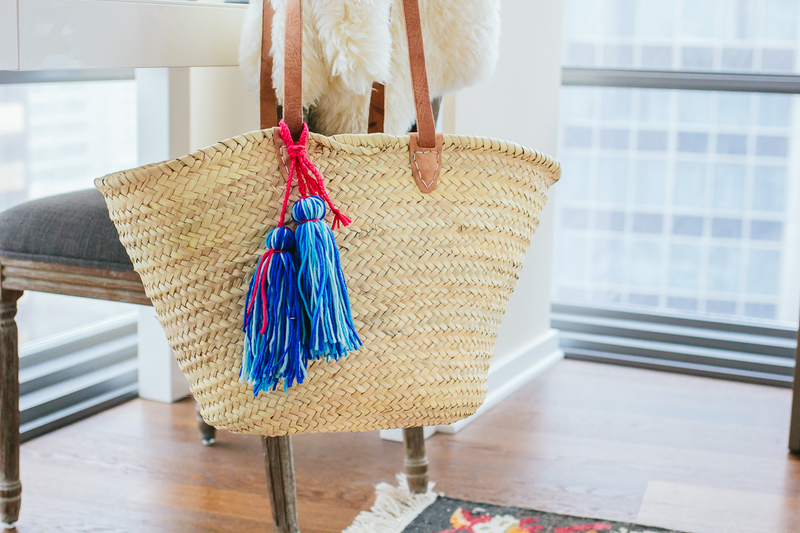 This DIY pom pom beach bag was incredibly easy and doesn’t require any real skills other than using a pair of scissors and pom pom maker and the total cost was far less expensive than what I found online. I also love that I now have the tools to make pom poms whenever (more projects coming soon!). I ended up going a bit nuts and made way too many pom poms and tassels so now I have a number of different attachments for my beach bag and can change up the look depending on how I’m feeling that day. My favorite is probably the pom poms with the black and white tassel, but I love the blue tassels too! Which would you carry? To make pom poms, I bought two sizes of pom pom maker — you can find them here (small) and here (large). For the majority of my pom poms, I used the bigger of the small set and the smaller of the big set. Directions come with the pom pom maker, but you can follow my images above for an easy visual lesson on pom pom making! Before putting anything together, I made all my pom poms and tassels first. 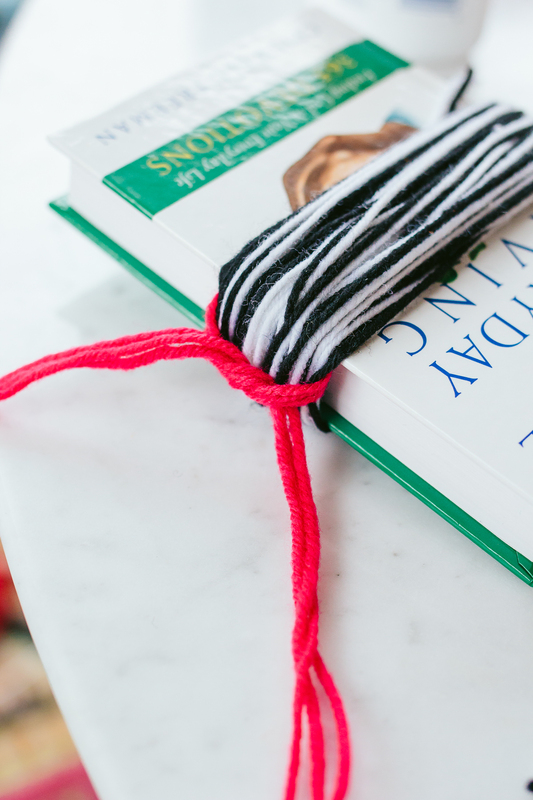 To make tassels, wrap yarn around a book. Change the size of the book if you want smaller or larger tassels. Tie a piece of yarn tightly around one side. Slide the yarn off onto a pen to tie the middle section. Once the middle section is tightly tied, but the bottom edge. After you make your pom poms and tassels, I strung them together with braided yarn using a yarn needle and tied them around the handle of the bag. The best part about this is that it looks beachy and bohemian, so don’t worry about making it perfect. One last tip — I used a touch of glue on the knots at the end of the pom poms so they didn’t come undone. Are you heading anywhere warm soon? What do you always pack in your beach bag? P.S. If you try out the project and snap a pic, tag it with #foxandshemakes on Instagram so I can check it out!